This site is now over three years old and since the conception a lot of changes and upgrades have been made. For the most part this information reflects the current status of the web site development. A good many of the pages from prior versions do not contain some of these features but as time permits the entire site will be upgraded to include the current features. There are no copyrights and no restrictions for the use of the greater portion of this site. The exceptions to this would be when we have used information, etc from other sources. This is always indicated on the pages. For example in the Nuclear Time Line some of the information came from Nuclearfiles.org and all articles that were used contained the information that they requested be present. Please check it out and respect these terms from outside sources. This site was designed for a 17 inch color monitor. The desktop settings for size are 1024 x 768 pixels and is best viewed using these settings. Underlining is used on the entire site to indicate a link. If you are reading any text and you see something underlined you can click on it for further details. For example if you are reading "Peacemaker Marcus Atkinson has spent much time......" you can see that Marcus Atkinson is underlined. Click on it and you will see further information about Marcus. Try it. All pictures in this web site are linked to further information. For example if you are looking at a picture such as you see here move your cursor over the picture and click on it for an enlargement of the picture as well as some details about the picture. Try it. The link colors were ignored in the early days but with the addition of so many new pages and links especially within the last year it became quite obvious that this was an important feature to use. For all new additions a visited link will have a green color and the current link will have a blue color. The shades of these colors may vary but they will basically be a shade of green or blue respectively. As time permits the whole site will be updated using this color scheme. The Navigation Bar shown above has been developed to provide users a method of finding important features of this web site without having to do too much hunting around. They will be described from left to right. Peacehq's logo and home page link: This will take you to the first official page of this web site and is also where you will find the language translators. Site Indexes: This will link you to the home page for all site indexes. Most indexes will be in alphabetic order. The Peacemaker's index will be by first name. Should a person normally be refered to with a title such as Sister Denise or Brother Utsumi they will be in the S index and the B index respectively. Origin: This link, if present, will take you to the page from which the page you are now looking at originated from. That does not mean it will take you back to the page you came from, just where this page has it's origin. For example each Profile has a picture. If you enter the site on that picture page clicking the Origin should take you to the Profile it was linked to. Not all Navigation Bars have an origin. The Home page for example has no origin. This Help page originates from any one of thousands of other pages in the site. We know that we could have used frames as a technique that would allow us to not have to worry with this but we decided not to use frames for browser compatibility purposes so this is the best we could come up with for now. FootPrints For Peace: There are two links involved with FootPrints For Peace. The first one, Home, will take you to the Home Site for FootPrints. The second, Here, will take you to the sub site within Peacehq where certain selected actions and information are published. The FFP logo is shown to the right. Where you see it in this site you should be able to click on it to get to the Home page for FootPrints. International Peace Pilgrimage: Peacehq and FootPrints For Peace work in close co-ordination with the International Peace Pilgrimage. 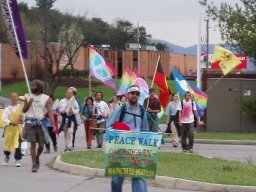 This link will take you to the pages published by Peacehq for The International Peace Pilgrimage. The home page invoked by clicking this link will have the information on how to get to the IPP home site. The IPP logo is shown to the right. Where you see it in this site you should be able to click on it to get to the Home page for the IPP. Search: This will invoke a Search Engine page that will allow you to search this site as well as the internet. This is a great feature if you are looking for something specific. Help: You got to this page by clicking this link. Some of the older versions showed a picture of a question mark. There is a lot of information contained with Peacehq and all the sub sites contained therein. There are quite a few indexes available that will hopefully allow you to find what you are looking for. There is also a search feature available in the Navigation Bar. There are a number of formats used for the Index pages. The older formats are very specific in nature and will eventually be replaced. The new formats are very similar and have common features that will be explained in the example below. The first two lines identify the name of the index. In this case it is the index used to locate Peacemakers. If there are enough links the index will be divided into alphabetic pages and the beginning letter will be shown in the heading. In the example all the Peacemakers with names beginning with the letter A will be shown. To the right are the links to the other indexes that contain information beginning with the letter you want. Shown in parens are the number of links in the page beginning with the letter shown. If (0) is shown there are no links available. In the example there are 13 starting with A, 11 starting with B, 7 starting with C, etc. Try one. If you tried one and there are more links on the page than are shown in this example it's because this is an example! The standard Navigation Bar will be on every index page as well. Note that all information shown may not be linked and is simply used for information such as the index for City Visitors which has a list of all the cities that have viewed the site. There are however, links in the City Visitor's page indicating that additional information about the city is available. For example Oak Ridge Tennessee, United States. Try it. This site is designed from and with the spirits of the Walkers and Runners who take part in these actions. Almost every page related to these events has an embossed background picture related to one of the events. Since it is near impossible to have a background with a lot of colors in it all these backgrounds are dark and the texts are white. If your computer blocks pictures you are just out of luck unless you want to change your settings to allow pictures from this site. Hello Cyber Visitor! If you just trolled into this page off the Internet we welcome you and invite you to visit the many stories contained in this web site. The site itself is not owned or operated by any organization or single person. It is maintained by volunteers that describe themsleves as Stewards, caretakers if you will, of the site. The stories, pictures and most information within the site come directly from the participants in the stories presented. They are called Peacemakers. This site is dedicated to those folks and all others who strive for peace, justice and nonviolence by putting their feet on the pavement, their sweat on their shirts, and who support the just cause of bringing peace and justice to this world! We hope you will enjoy your visit to cyber peace. Peace and love from the Stewards Of Peacehq.